Please turn off your smartphones and tablets as we prepare to say “I do”. 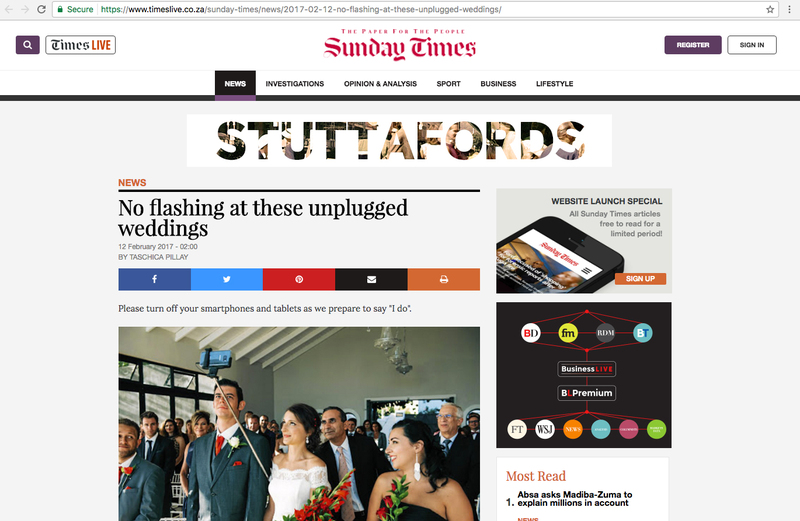 That’s what a number of bridal couples are asking their friends and family as “unplugged” marriage ceremonies become more popular in South Africa. Johannesburg photographer Daniel West said that in the past two months he had shot 10 unplugged weddings. He said many professional wedding photographers supported the unplugged trend. “It makes our jobs much easier when we don’t have to photoshop someone’s phone out of the foreground or background,” West said. The couple said their guests were happy to comply. Shireen Louw, their official photographer, said unplugged weddings made her job a breeze. “That keeps the aisle open for us to take beautiful photographs of the bride walking down instead of dodging people’s heads. “It also is very distracting when people use cameras that make sounds and flashes continuously during the ceremony,” Louw said. But when Johannesburg couple Adeline Geagea and Mikael Cordonnier got married last year, they live-streamed it so that relatives overseas could share in the event. “We chose not to have an unplugged wedding. We wanted to share that special event and the best way is with pictures and videos,” said Geagea. She confessed to being a bit shocked when her uncle thrust a selfie stick between her and the groom.